Without congressional approval, on Thursday night the United States attacked a Syrian airfield. The move comes after the U.S. accused Assad’s forces of using the air base to carry out a chemical weapons attack that killed 86 people, including at least 30 children. Syria denies carrying out the attack. 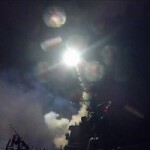 Without congressional approval, on Thursday night the United States attacked a Syrian airfield, marking the first military action by the U.S. against Syrian President Bashar al-Assad’s forces since the Syrian war began over six years ago. The move comes after the U.S. accused Assad’s forces of using the air base to carry out a chemical weapons attack that killed 86 people, including at least 30 children. Syria denies carrying out the attack. “After six years of watching genocide, … today I am very happy that there is one less airfield,” says Lina Sergie Attar, a Syrian-American writer from Aleppo, in the first part of our roundtable discussion. Alia Malek, journalist and former human rights lawyer, and Phyllis Bennis, a fellow at the Institute for Policy Studies, also speak. “The hypocrisy of it from the vantage point of the Trump administration is staggering,” Bennis says, calling the strike an act of war and arguing all sides in Syria have violated international law. The roundtable discussion on Syria continues after the United States carried out a missile attack on a Syrian airfield, saying it was a response to a chemical weapons attack that killed 86 people, including at least 30 children. Syria denies carrying out the attack. “Both these superpowers … do not give a damn about Syrian self-determination nor justice for Syrians,” says Yazan al-Saadi, a Syrian-Canadian writer who joins us from Beirut. “We do want something that will be positive for the Syrian people,” adds Medea Benjamin, cofounder of CodePink. “That means immediately lifting of the Trump ban on Syrian refugees coming to the United States, of funding of the $5 billion that the U.N. says is desperately needed to help the humanitarian crisis facing the Syrian refugees, and demand that the U.S. work with Russia to finally come to a ceasefire and work for a political solution.”. Neil Gorsuch has been confirmed to the Supreme Court in a final Senate vote today, replacing Justice Antonin Scalia nearly 14 months after Scalia’s death. This comes after senators voted along party lines Thursday for a historic rule change that allows Supreme Court justices to be confirmed by a simple majority.